Answering large family objections, Final Part - My, how small your house is! Finally, inevitably someone will inquire about the size of the house a large family lives in, as if that should be a major deciding factor. This is a thinking that I can sympathize with, because I, too, used to think that big family = big house, simply by necessity. However, over the years as I have talked to other large family moms, I have noticed that besides medium-sized families in average sized homes, there are pretty much two extremes: large families in small homes, and small families in large homes. I don't think this is a coincidence - people are choosing to have either a big house, or a big family. At approx. 1550 sq ft, our house is definitely considered on the small side for a family our size, at least by today's standards (4 bedrooms, 2 bathrooms, plus dining/school room, kitchen, living room, no garage, but two good-sized sheds). Even just a hundred years ago, however, our house would have been considered a mansion, and that even long before indoor plumbing and heating/air conditioning were standard conveniences. No, judging by most of history, and even the vast majority of the world today, we live in the lap of luxury. There are those who suppose that "gain is godliness," so to them, bigger equals better, but I think just the opposite is true. By virtue of the fact that there are many of us living under the same roof, and that the bedrooms are - well, bedrooms for sleeping in and not for children holing up in by themselves, we have grown very close as a family. Games and activities take place in common areas like the kitchen or living room. For better or for worse, we are around one another much of the day, and it really does change who you are as a person. For the better, I like to think, as selfishness is the one thing we simply don't have room for in our house. You see, it doesn't take much room to find sleeping quarters for 11 people. We will not need to bust out the shoe horn to squeeze this new wee one in. No, the thing that eats up space is stuff. We would all do well to have a lot less stuff, and a whole lot more time spent with one another. There are authors making lots of money writing books about how to cut down on all the clutter and things, which just add mental baggage and stress, not peace and prosperity. Less truly is more! For now, we will simply lengthen our cords, and strengthen our stakes. Since my morning sickness has up and left for good a couple of weeks ago (YAY! ), I have been working like a crazy woman at radically simplifying our lives by getting rid of things we neither use, care about, or would ever miss. Having lived in the same house for a decade, there has been plenty of time for things to accumulate that we really don't need. I have been nothing short of ruthless, getting rid of anything none of us were excited about (okay, the youngest ones' opinions don't count, as they would like to hoard even outright garbage). My goal is to downsize by about 50% or more overall, but in areas like clothing and toys, more like 80%. We have filled dozens of lawn bags with things to be thrown away, have donated many, many boxes of things and have sold others online, and still have an entire room full of stuff to be sold at an upcoming yard sale. And honestly, none of us is missing any of the things we got rid of. In fact, the backbreaking and allergy-inducing work aside, this project has been very satisfying and liberating. The big boys and girls are fully on board, motivated and helping, as they, too, understand the benefits of living more minimally, and actually having time to play with the few things they care about, rather than spending all their free time being curators of a toy museum of items they don't really use. Also, they cannot wait for the de-cluttering to be done so we can switch around the bedrooms. The triple bunk bed in what used to be the boys' room. Yes, we usually always have sheets on our bed, not sure why we posed for pics without them. The three girls will move into the current boys' room, which has a beautiful triple bunk bed in it, and even has a toddler bed under the loft part for a possible future sister (the toddler bed is now where the little bookcase and dresser were in the above pic). Us parents will move our bedroom into the former girls room, which will open up the largest room in the house, currently my bed room, for the boys. All five of them will be moving in there. 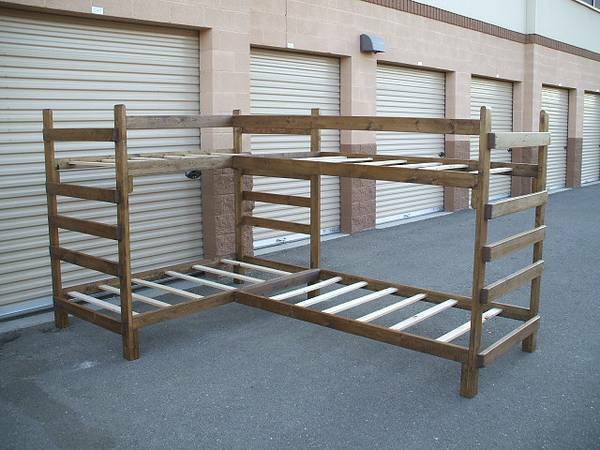 To that end, we will commission the same carpenter who made the triple bunk bed to make a quadruple bunk bed (twin over full, and twin over twin, in an L-shape), and will also add a toddler bed for Boaz for now. This can later be upgraded to another bunk bed (twin over full) if the boys keep outnumbering the girls. That configuration provides ample sleeping room for as many as 13 children in all, a number we are still very far from, and may never even reach. Our fourth bedroom has a guest bed in it and also doubles as the office, so we won't count that. The new quad bunk will be similar to this, except that the sides will be reversed, and one of the beds in the bottom will be full size, not twin. Years ago, I thought that surely, eventually we would have to move to a bigger house. But now, as our family has grown, and even though we are in a position to move if we wanted to, I no longer want to move. Five of our children were born in this house, and if I can, I would like to grow old here and have all those memories to cherish still. We like our neighbors, we like our neighborhood, we like our pool and yard, we like being close to church and the city, we like that our church started in this house. When the kids are grown and gone, this house will be HUGE for us, and we will have so many wonderful memories here. The kids will love bringing their own children over to their childhood home. No, if we can make do where we are, we gladly will. We will live smarter, not larger. And while those who don't know better feel sorry for our kids that they share bedrooms, the kids will go to sleep whispering and telling stories, scheming, making priceless memories, and growing closer each day. To them, it's like summer camp every day. We all make our choices - this is ours. We love our kids far more than worldly possessions, and are thrilled to have been blessed with another one on the way. We had a lovely Thanksgiving, and I hope you did, too. Due to my crazy-busy de-cluttering during the past week leading up to Thursday, I really had zero motivation to precook any part of the big dinner. Well, I tried making the cranberry sauce the day before, but forgot about the orange juice and brown sugar simmering in a pot on the stove until I smelled the charcoal it had turned into (literally). We again brined the turkey this year, and then a sweet family at our church smoked it for us. Incredibly delicious! We may never be able to go back to plain ol' turkey. So with the bird already fully cooked ahead of time, it made things a lot easier for me in that I only had to make the sides and desserts on the big day itself. Thursday morning, we had a leisurely breakfast of ready-bought sweet-spicy breads, with hot cocoa on the side. Then the kids spent the morning playing outside, riding their bikes, and going to the park with Dad while I made the meal and laid the table. This is our new dining table. It is very simple in that it is just an 8-ft plastic folding table with plastic folding chairs, but it works so much better than our old table which was nicer, but simply too bulky for this long but narrow room, without offering enough seating to fit all of us comfortably. I bought several different festive fabric prints during the pre-Thanksgiving sales at Jo-Ann's to make quick and easy tablecloths, which I then covered with some clear vinyl to make the table easy to wipe down after each meal. Simple, but I just love it! Eventually, I am hoping to have a wooden farm table made with these exact dimensions, and a bench along the window side of the table. For now, this will do, and it makes me very happy. It has been so nice being able to eat meals together as a family without a major logistical hassle! The kids all love it, too. After such a late lunch, the little kids all took a long nap, while I plucked the meat off the turkey, made soup with the carcass, planned the Christmas menu, and then took a nap myself. The older kids played board games with Dad. For dinner, we followed our family tradition of serving desserts and hot cocoa only. Then baths and showers all around, followed by family story time. We all went to bed tired and happy that night. We have yet to finish decorating the house for Christmas, but we did get the tree set up today, and I am busily finishing up the kids' advent calendar before Tuesday. I am keenly aware of the fact that holiday seasons like this, with all of our kids still living at home, are numbered. There may only be a handful more if our kids marry as young as we did. I am trying to strike a balance between making as many great memories as possible, without allowing this time to become too stressful, or the children too indulged (it happens - ha!). I will talk more about that in my upcoming post on toy/stuff-free gift giving, and on focusing on quality time and special experiences together, rather than on buying more things. Answering large family objections, Part 2 - My, how old you are! Another common objection to having lots of kids is the mother's age. At the ripe old age of 36, I am considered an "elderly grand multipara," something I can only laugh at. It is no coincidence that God designed women's bodies in such a way that they go into menopause in plenty of time to see even the youngest child into adulthood, barring any tragedies (which, as the name implies, can strike anyone, at any age). There are many studies that show that older mothers usually have better pregnancy outcomes, increased fertility if they started having kids when they were young, carry to term more often, have higher rates of twinning, and have smarter kids than younger mothers. And really, it should come as no wonder. Whereas I was deathly ill and throwing up 30+ times a day with Solomon, I have learned how to prevent that. Whereas we could not afford all of the best supplements as newlyweds, and had a $40 weekly budget for all our groceries and toiletries, nor did we have any knowledge of what "healthy" truly meant, we are now in a position where I can buy the top of the line supplement of any kind, and afford the most nutritious foods. Whereas I used to have to do all my work as usual, even when sick and pregnant, I have now reached the "Queen Years" where my older children are willing and able helpers. Years of being pregnant have taught me some "tips of the trade" that young mothers simply have not yet had time to learn. Everyone knows that the longer you do something, the better you become at it. Nowhere outside the realm of motherhood are the 40s considered "old" - these should be our prime years, and if you have lived a life following God's rules rather than partying, drinking, doing drugs, switching partners, and generally living a hard life - they will be! Of course, the mother's age being a factor is a relatively new notion, as throughout history nature has of necessity been allowed to run its course. We were recently given an old family Bible that had a family registry in the front. The couple who originally owned it had married in 1901, and their first child was born in 1903. They went on to have a total of 13 children, all born about two years apart. Two died in infancy (one at 1 month old, the other at 8 months old). Clearly, this couple did not practice birth control, had children during all their reproductive years, and went on to live long and presumably happy lives with their children and grandchildren (who were also listed in the family Bible). I really don't think that the thought on their death beds was, "We should have quit after the first two kids, and not had those ones in our 40s." Answering large family objections, Part 1 - My, how neglected and overworked your other children are! Haters of large families will never understand that one of the best gifts we can give our children are more siblings, and the knowledge that all of them are very much wanted and loved. Parents of many are often accused of not possibly being able to spend time enough with each child. This is absurd considering that none of our children have ever spent a day of their lives in daycare, have had a stay-at-home mom all along, and are all homeschooled, which puts our kids home for 40 more hours per week than kids who are in school. We could spend an hour and a half with each of them individually every day of their lives, and still get around to all of them during their waking hours. Such an absurd notion, born of people who are accustomed to shipping their kids off to be raised by others from the cradle up. Sheesh! But even if it were true that our children get less time with us parents - they get lots more time with their siblings, which is what they really want. I grew up in a family of five, and never once did the thought cross my mind that we were being short-changed in the area of parental attention. I have memories of doing things with just my mom on occasion, but I have far more memories of games I played with my siblings, and the great times we had with each other. Kids are not as keen on having the undivided attention of their parents as some seem to think they are. Siblings are so much funner for getting into mischief with!! Of course, these same people will then go on to claim that our generally neglected and poorly attended children are made to slave in the family household from dawn to dusk, as we parents are eating bonbons, taking a nap, or busy making more babies. Whoever thinks that any child on the face of this earth will keep working of his own volition, without being supervised, guided, encouraged, helped along, and instructed (again and again), has clearly never worked with children. Or has a hole in their head. Or both. Keeping kids working is a full-time job. In fact, keeping anyone working is a full-time job. It's called being a "manager," and people get paid big bucks to be one. Because as humans, getting us to work is a job in and of itself - at least until personal responsibility and work ethic are developed, something that is a characteristic of a mature adult, not a child. So to say that our kids are doing all the work while we are fooling around is not even possible. Do our kids help around the house? Of course! Oh the horror - having jobs and being responsible for someone besides oneself! How in the world will they have the opportunity to grow into lazy, self-centered adults, if we do not first squash their natural desire to be a productive part of the family? Having older kids is such a blessing! They know what needs to be done around the house, and at this point, often help out even without being asked. But believe me - they sure weren't born knowing how to be productive! They also love cooking, especially Isaac. For him, it is a huge treat when he gets to make dinner from scratch, all by himself. Talk about a win-win! The middle aged children help by playing with the younger ones, reading to them, etc. We have definitely reached at a point in our family life where even though we are super busy, life isn't getting that much harder as we add more kids. When you have one child and you add a second, your work load just doubled. When you have 8 and grow to 9, you are only increasing the work load by a little over 10%. The way we see it, we have always had a baby. Then we had a baby and a toddler. Then a baby, a toddler, and a preschooler. Those were the hardest, busiest days. Now, we still have that busy little baby, toddler, and preschooler - but we also have (almost) two teens and three other older siblings to help keep the little ones busy and out of trouble.We don't look at is as adding little people, we look at it as adding older helpers every couple of years, because the little ones have been with us for well over a decade now, whereas having increasingly older helpers is ever new. You know how they say kids grow up in the blink of an eye? Well, in much the same way, it seems like just yesterday that we started our church. It certainly doesn't seem like a DECADE ago! Yet, in a little over 5 weeks from now, we are celebrating our 10-year church anniversary. 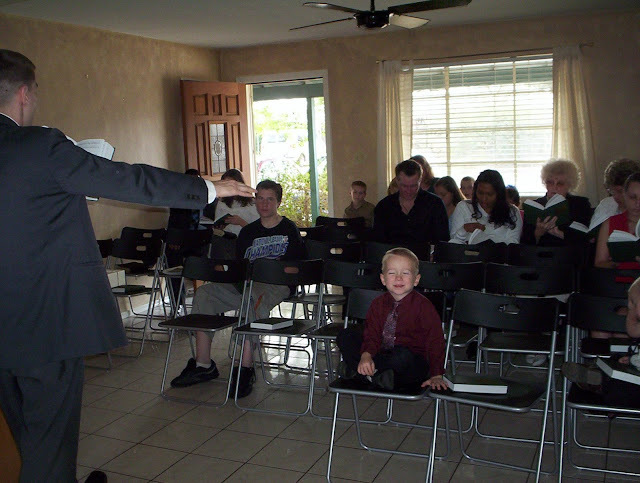 And, much like a mom will look at her grown child and always see her "baby", I see our church as the same it was when we had our first service, in our living-room-converted-to-an-auditorium with just 9 people in the first service on Sunday morning, Christmas Day 2005. Five of those were our own family! The family of two of the ones who came are still members of our church, which is very dear and special to us. Our current Sunday morning record is 185 in attendance, set just this past week, and yet I look at the crowd and it seems like nothing has changed since those early days. Just a group of dedicated Christians who sincerely love the Lord, and each other. Ah, memories! There have been many ups and the inevitable downs, much like anything in life. My husband and I love our church dearly, and are very blessed to be able to serve God through this ministry. Some of our key members approached me months ago, sharing their hopes of making this anniversary an extra special one for my husband, who truly labors in the word and doctrine every single day. To that end, they have several surprises planned for him. Paul Wittenberger put together a short video that explains a little more about this, and someone else at our church has set up this website that has all the details, which I don't want to reveal here on the off chance that my husband is reading this post. Additionally, my husband has also been informed that surprises are being planned for him, and that there is a website with all the info. He has been asked not to visit this website should he see it promoted. So please feel free to share this post. I have held off sharing the website for several months, but since we are close to the special service, it's time to spread the info near and far, so as many as possible can join us on that special day. So please visit the website here and join in the celebration! 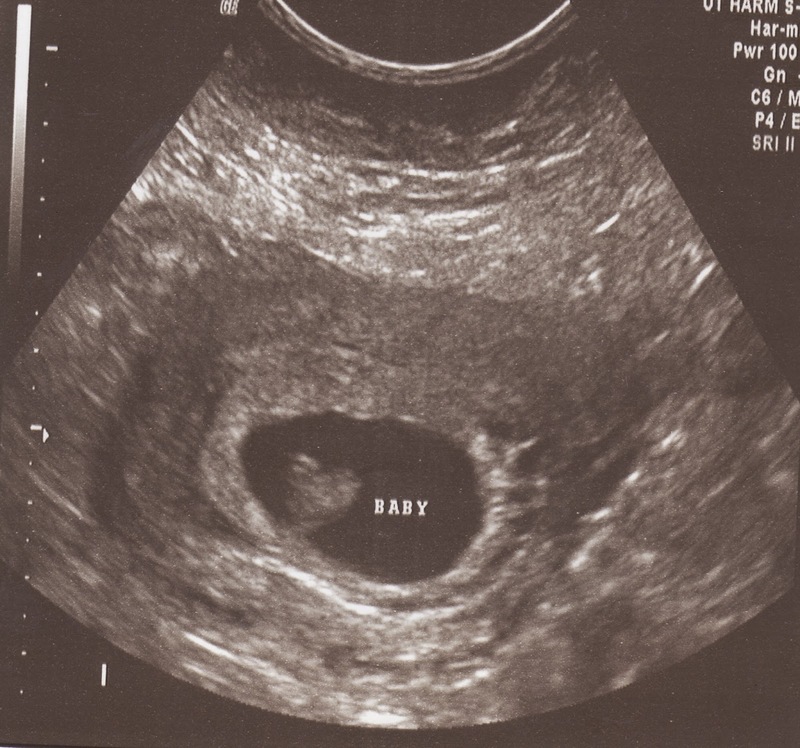 This ultrasound picture was taken when I was 7 weeks along. And yes, just ONE baby. After all we went though with the last pregnancy, I was eager to find out that with only one baby on board this time, things should hopefully be blissfully uneventful. I am currently almost 13 weeks, so only days from entering the second trimester. This means baby is due in the latter half of May. All things considered, I am feeling well. Even when the morning sickness was at its peak, I was able to go camping, and was also fine on my little getaway last week. Be on the lookout for a more detailed post on what is helping me to keep the nausea at bay. I have been more tired than usual, but getting some extra hours of sleep each night has been helpful. For the first time ever in my 15 years as a wife and mother, I am going on a solo getaway! Well, not quite solo as Miriam will be joining me for company, but the rest of the family is staying home with Dad for three whole days and nights. Miriam and I are flying out tomorrow night after church on the all-nighter to Buffalo, NY, where we will be arriving Thursday morning. We will have the entire day to explore Niagara Falls. This is the last week that the "Maid of the Mist" boat tours are offered before they close for winter. Temperatures are forecast to be in the high 60s, which is great for this time of year. We will then be spending the night at a hotel within walking distance from the falls. Friday morning, we will sleep in, and leisurely make our way out farther East in NY state where we will be attending a Ladies Conference at another church. Since we have all Friday to get there, I am thinking about either taking a scenic route along Lake Ontario, or going a little out of our way and stopping at Letchworth State Park, the "Grand Canyon of the East." The conference runs from Friday evening to Saturday afternoon. Our flight home again leaves Saturday evening, and we'll get home shortly before midnight. Can you imagine how excited we both are?!? Miriam has not stopped counting down the days since she found out about the trip a couple of weeks ago. If you think of it, please pray for safe travels for us, as well as my husband who will be playing my part at home while we are gone. I'm not sure he knows what he is in for... muahahaha!